Literele de pe margine indică prima, respectiv ultima literă de pe linia sau coloana unde se află. Petru saves the form and switches off the laptop, then grabs the newspaper – he always reads the newspaper while he drinks his coffee in the morning. 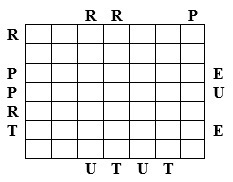 On each row and on each column, each letter appears once and remain 2 blanks. The letters from the sides indicates the first, respectively the last letter of row or column they belong to.